Joe Dorish Sports: Who is the Only Golfer to Defeat Tiger Woods in a Playoff? 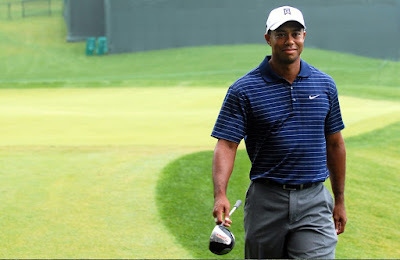 In his remarkable golf career Tiger Woods has been in 15 playoffs and he has only lost once. Can you name the only golfer to defeat Tiger Woods in a playoff? In the 14 tournaments that Tiger Woods won in a playoff, he defeated seven players who are golf major winners. The seven are Davis Love III, Tom Lehman, Ernie Els (twice), Jim Furyk, John Daly, Jose Maria Olazabel and Stewart Cink. Tiger Woods also defeated two other very distinguished golfers in playoffs - Miguel Angel Jimenez and Colin Montgomerie. So he defeated very good golfers in 10 of the 14 playoffs he won. However, Tiger Woods also defeated some very mediocre players in playoffs and the player who did beat him in a playoff did not have a very distinguished career. The four mediocre golfers Tiger Woods defeated in playoffs are Bob May (one PGA career win), Chris DeMarco (3 career wins), Nathan Green (one career win) and Rocco Mediate (six career wins). So who is the one player who did defeat Tiger Woods in a playoff? In the 1998 Nissan Open (now called the Los Angeles Open) at the Riviera Country Club located in Los Angeles, California, journeyman golfer Billy Mayfair defeated Tiger Woods in a playoff. Mayfair was 32 years old at the time and Tiger Woods was just 22 years old. At the 1998 Nissan Open, both Tiger Woods and Billy Mayfair shot -12 under (260 each) in regulation (272 par) to tie for the lead (both players birdied the last hole with Mayfair needing a birdie to tie Tiger for lead). On the first playoff hole, Mayfair hit a 85 yard wedge shot that almost went into the hole and ended up five feet away. Tiger Woods shot from the fairway landed 15 feet from the hole but Tiger missed the birdie putt and Mayfair drained his five footer to become the only player to ever defeat Tiger Woods in a playoff. For his career, Billy Mayfair only won five times on the PGA Tour. The biggest win of his career came in 1995 when he won the Tour Championship but that was well before the FedEx Cup Playoffs and his win only earned him $540,000. Tiger Woods has certainly had a remarkable career and his playoff record of 14-1 is brilliant. For comparison purposes, Jack Nicklaus was 14-10 in playoffs including 3-1 in golf majors. What was Billy Mayfair's career record in playoffs? A not very good 2-5 which included losses to such notable players as Jodie Mudd, Jim Gallagher, Jr., Ed Dougherty and Jose Coceres. But on March 9, 1998, Billy Mayfair did become the only player to ever defeat Tiger Woods in a playoff. That is not a bad claim to fame for anybody.